Ok so usually baking is a rewarding venture for me. I find a recipe, I follow it, make some tweaks here and there, get a yummy result, and get compliments from whoever I share it with. Lately, though, I’ve had mixed results and mixed feelings. This story starts out happy. There was a birthday cake to be made. In an effort to use up some extra buttermilk, I strayed from the standard family chocolate birthday cake recipe, to a version that trades regular milk for buttermilk. It’s an Ina Garten recipe, and it turned out great. So great, in fact, that it’s making my family rethink the traditional family birthday cake recipe. With these chocolate cake recipes in my arsenal, buying a chocolate cake mix from the store is out of the question these days. Fabulous cake: check. Now onto the frosting. My plan was to make “White Mountain Frosting” or “Seven Minute Frosting.” Typically a combination of egg whites, sugar and water that yields a light fluffy frosting. I have tried two different recipes three separate times (following the recipe to letter). I can not get the frosting to fluff. It falls flat no matter what I try. To mitigate my repeated frosting disaster I used the flat frosting (which still tasted quite good) as the frosting between the cake layers, and a “glaze” for the top of the cake. 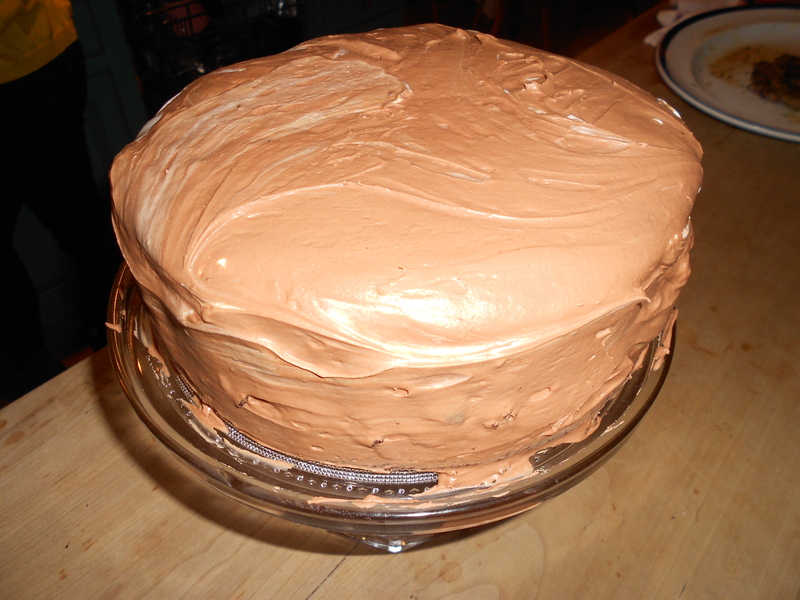 Then to disguise this monstrosity, I made a quick, easy chocolate frosting to cover the outside of the cake. Crisis averted. 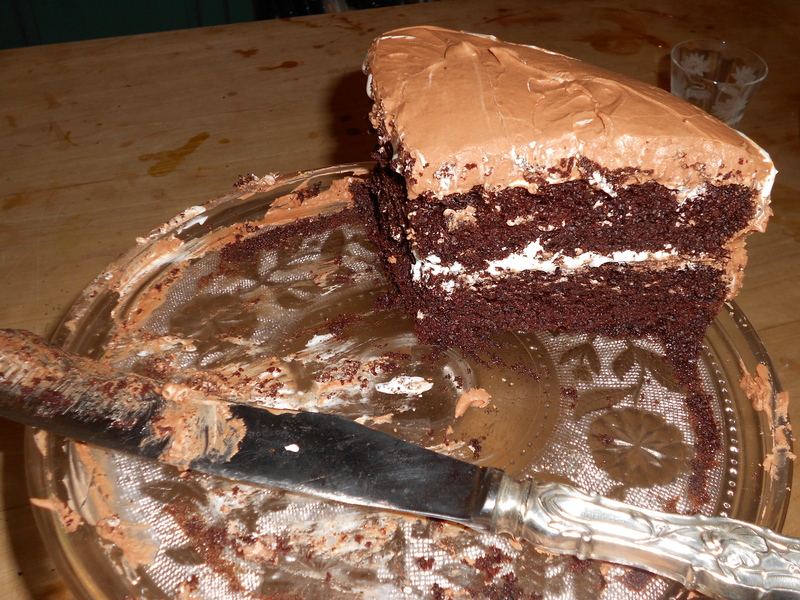 The funny thing was that the combination of the two frostings made for a very moist cake. The flat White Mountain Frosting was almost like having a layer of marshmallow fluff under the chocolate frosting. Preheat oven to 350. Prepare pans by spraying with non-stick spray and coating with cocoa powder. 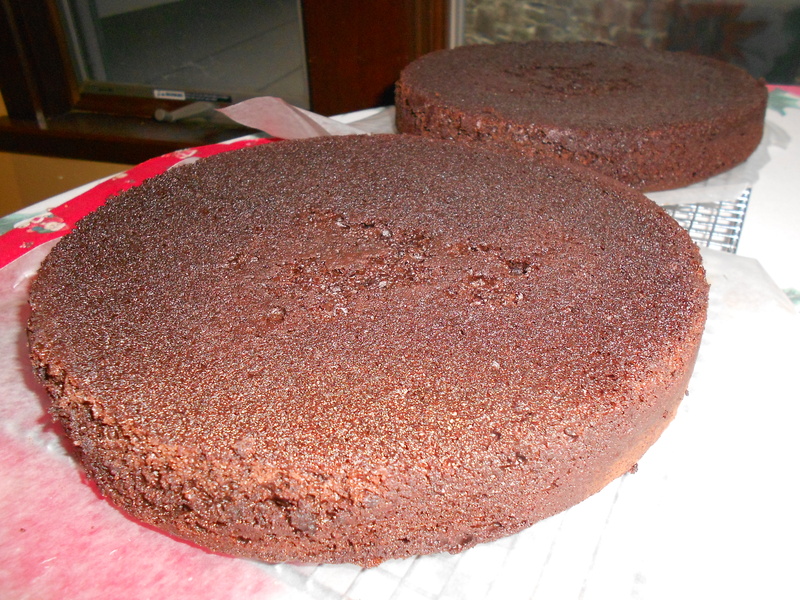 If you want to be extra cautious, cut out a circle of parchment paper to fit in the bottom of your cake pans. Sift together flour, sugar, cocoa, baking powder, baking soda, and salt. In a separate bowl, combine buttermilk, oil, eggs, and vanilla. Add the wet to dry gradually and beat with an electric mixer. Finally add coffee gradually. Bake at 350 for 35- 40 minutes until a tester comes out clean. 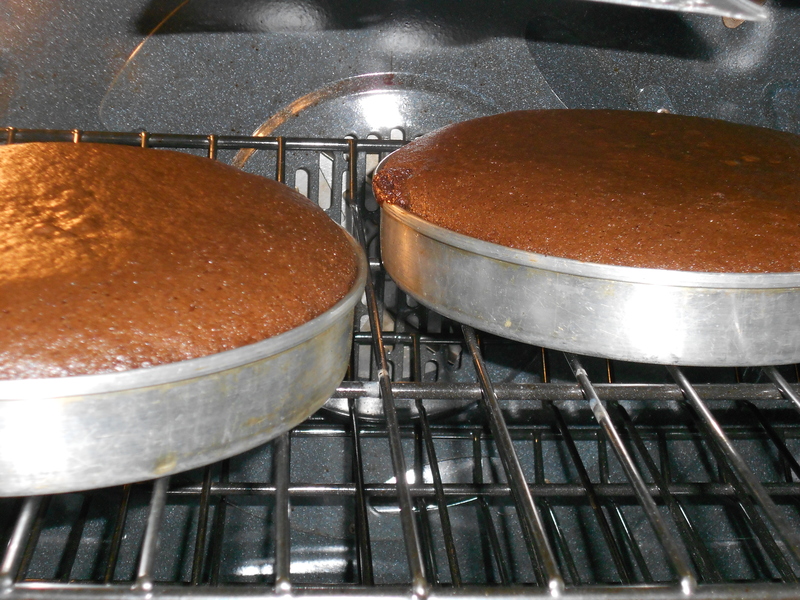 Allow to cool for about 10 minutes before you remove the cake from the pans. in a small sauce pan combine the water, sugar, and corn syrup. Cover and bring to a strong boil. Take the lid off and bring to 242 degrees (use a candy thermometer). While the mixture is boiling, whip up the egg whites to stiff peaks. When the mixture has reached the right temperature, very slowly add it to the egg whites while you continue to beat them. Add the vanilla and beat for about 7 minutes. At this point the frosting is supposed to fluff up, but in my case it didn’t. You win some, you lose some. Using a small saucepan over low heat or a microwave melt the butter. Add the chocolate in small pieces and melt it with the butter. Put melted butter and chocolate in a bowl and add sugar, milk, vanilla, and salt. Beat with an electric mixer until it reaches the desire consistency. To thicken up the frosting place the bowl in an ice bath while you mix it, or refrigerate for a few minutes before frosting. now i’m hungry for cake!